Teenager, Cindy Meikin has a strange experience that puts her in contact with Sylvia, a girl her own age from another world. After taking Sylvia home she discovers that her mother, Natasha and herself came from this world. 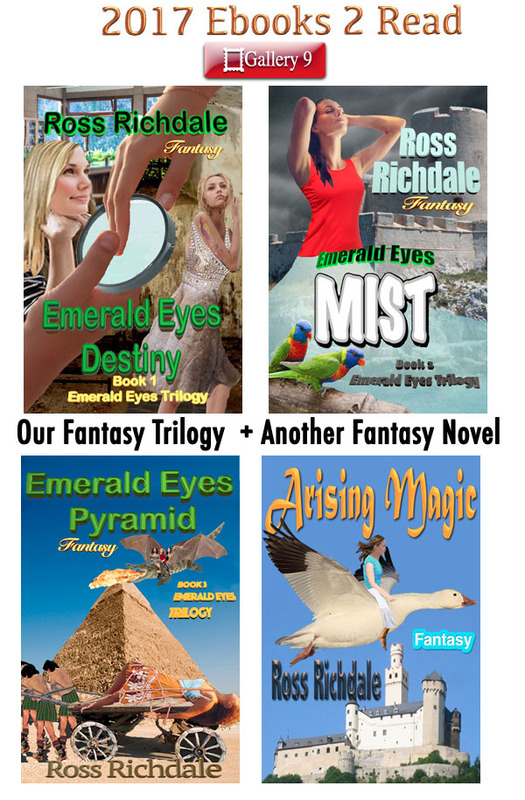 The trio visit this war torn land through a void where Cindy finds that she is an Emerald Eye Wizard with strange magical powers that come to her without being called upon. Select your publisher for more information. When Cindy and Sylvia are ice skating, a strange mist carries in a little bird with a message on his leg. Through a magical void they meet Gikre, a dwarf who is with Tulco, a girl with emerald eyes like their own. She is caught in a bear trap set by human invaders trying to catch her. They help Tulco but must cope with strange mists; a white one helps them but a red one is a terrible enemy. Select your publisher for more information. In this 3rd adventure, the emerald eyes wizards are sent a millennium back in time. Xentrix the dragon is with them and they rescue a flying girl, Kondel who is about to be sacrificed by priests on a pyre in front of a pyramid. These priests are determined to eliminate all flying creatures from their land. Birds have already disappeared and Kondel is the last of her species left. But is she? Select your publisher for more information. In the days of old, Kyla Kiro does not want to marry the evil Sir Edwin O’Hane. She persuades Shane Wynex the man she really loves to escape with her into the surrounding forest. She has friends there who can help, from Sliver a transman, half human and half tree to the forest dwarfs and talking birds. The prophecies from The Great Book of Everything That Will Be are about to be played out. Select your publisher for more information.